Curved stairlifts are designed to fit into homes which have different dimensions and shapes to traditional straight stairways. If your staircase curves or turns, then our curved stairlifts will be perfect for you. All installations are tailored to your home and your specific needs. We will visit your home and take all necessary measurements and discuss options with you prior to installing any rails that will be needed. 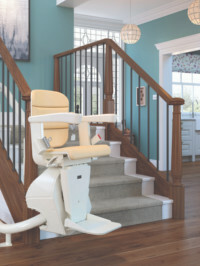 A curved stairlift can be developed to slide along the landing rather than stopping at the very top of the stairs, allowing the user to negotiate stairways within a safe, spacious area. 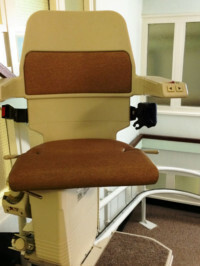 The chair can also be folded to leave ample space on the landing. 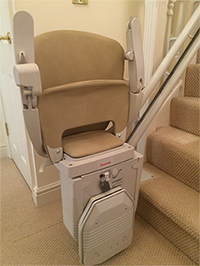 Curved stairlifts have been very popular in the Surrey area due to their ease of use and flexibility. 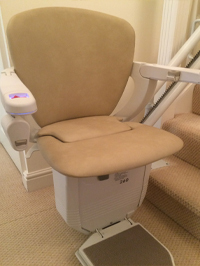 If you are thinking about renting or buying a curved stairlift, contact Surrey Stairlift Services today and let us find the right stairlift for you.